Authentic Sauro Bracelet Very Good Condition No Dings, Dents Or Scratches. White Gold 25.3 Grams With Extra Links. (See Photo). Width 1/4". MIAMI CUBAN CZ DIAMOND CLAW CLOSURE NECKLACE AND BRACLET SET. 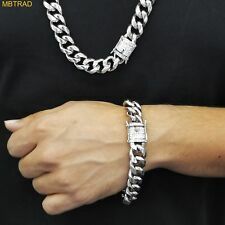 BEST PRICE FOR THIS AMAZING SHINY CUBAN CHAIN AND BRACELET SET WHICH WILL COST THOUSANDS FOR THE REAL PIECE BUT HERE FOR FRACTION OF COST U WILL GET THIS HIGH QUALITY FASHION PIECE. TIGHT links give thisCurb chain a young angular appeal. Choose white, yellow in 18kt gold gold. (MC230-10911). 8" -8 MM Wide - approx.42 grams 18 kt WHITE gold weight. 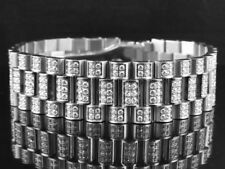 Feauturing is heavy solid stainless steel presidential bracelet with simulated/lab diamonds set throughout. Each link consists of sparkling lab diamonds all machine set in a CNC setting. Flawless finishing and build. • DIAMOND COLOR : G. • DIAMOND CLARITY: VS1. Nice chian! s 5 ( 26. FREE Trial! ) 2018-09-21. • WIDTH: 9mm. • Wrist SIZE : 7.5”. Reference Number 1802. 18k WHITE Gold. Silver Dial. Stamping Clearly Visible on Case but Hard to Photograph. Angular oval links add a clean structural look to the standard Anchor link - this would be a great necklace as well as bracelet chain. Choose white, yellow, rose or two tone in 18kt gold gold. 8" - 5.5 MM Wide - approx. Angular links add a clean structural look to the BRACELET - this would be a great necklace as well as bracelet chain. Choose white, yellow, or two tone in 18kt gold gold. 10" -4.5 MM Wide - approx. 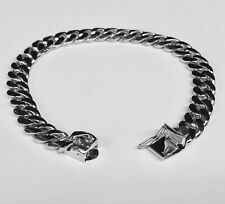 Just the right amount of flash in a clean angular link - add a clean structural look to the BRACELET - this would be a great necklace as well as bracelet chain. Choose white, yellow, or two tone in 18kt gold. 18k Solid White Gold Handmade Anchor Mariner Link Mens Bracelet 7mm 14 grams 7"
Look like you own a goldmine! Younger, more in command is what the squared off edges of this variation on the traditional Mariner link says about you! Feel the ocean breeze - this elegant Mariner link at your neck or at your wrist will put you there. Gold : 18k. Weight : 20.40 grams. All gold are 100% genuine. Not plated. Photos have been enlarged to show detail. Diamond Information. Resizing and Fees. Sauro 18k White Gold Men's Bracelet Made In Italy -Pure 18k gold. -Brev Sauro horse logo on bracelet. -Sauro 18k Italy 750 stamped on lock. -9 inch bracelet length. -38.7 grams total weight of bracelet. Showroom model. Nice gift box included with purchase. Squared off links give thisTIGER EYE link chain bracelet a young angular appeal. Choose white, yellow in18kt gold gold. Angular oval links add a clean structural look to the standard link - this would be a great necklace as well as bracelet chain. Choose white, yellow, or two tone in 18kt gold gold. 8.5" -7 MM Wide - approx. Total weight: 23gr. Once you have it, it says about your perfect taste. Baraka fan! Barakà ORO 750 Rubber Armband. 18K yellow/white gold and natural rubber. Great collectible bracelet for an avid. TIGHT links give thisCurb chain a young angular appeal. Choose white, yellow in 18kt gold gold. (MC230-10911). 9" -8 MM Wide - approx.47 grams 18 kt WHITE gold weight. Angular oval links add a clean structural look to the standard Anchor link - this would be a great necklace as well as bracelet chain. Choose white, yellow, rose or two tone in 18kt gold gold. 10" - 5.5 MM Wide - approx.